Coniferous trees found across North America possess foliage in the form of needles, with marked differences helping you to identify them. Among the attributes that can help you decide what species these needles belong to is their length, shape, how they grow from the branches and their colors. Size of needles helps immensely in their identification. Comparing the needles of two members of the yew family, you would see that Pacific yew has needles in the range of 1/2 to one inch long, while California torreya has needles as long as 3 1/2 inches. Needle length is important again when identifying pines. Two trees with a similar geographic distribution--the sand pine and the slash pine--have needles of contrasting length. Sand pine needles will be about 3 inches long; sand pine needles are from 8 to 10 inches. The arrangement of conifer needles on the branches is significant, especially in identifying various pines. Pine needles develop in bundles, with some pines, including Eastern white pine, having five to a bundle. Others can have as few as two, the case with species such as bishop pine, sand pine and Virginia pine. The needles of spruces grow on what appears to be a “woody peg,” according to “Trees of North America.” Fir tree needles emerge directly from the limbs, while those of hemlocks narrow into what amounts to a short stem at their base. The shades of green of needles on conifers varies, aiding in identification. 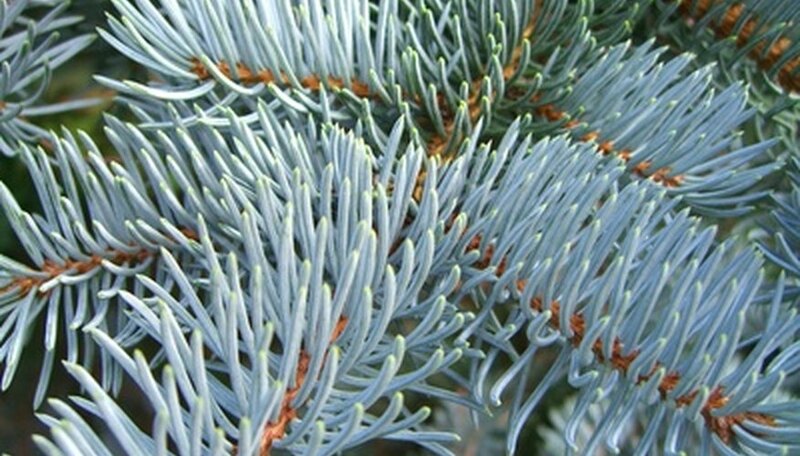 Pacific silver fir needles, for instance, are dark green above but a silvery white below. Colorado blue spruce needles are famous for their blue-green tint. Needles of knobcone pine are a pale yellow shade. Western larch features light green needles that change to yellow in autumn before they come off the branches. The shape of needles--flattened, plump in cross-section, blunt at the end or pointed--can indicate what tree they come from. The needles of hemlock are narrow and flat. Black spruce needles in cross-section have a diamond shape, as opposed to the rounded or square cross-section view of the needles on an Englemann spruce. Other needle features can give you valuable clues in their identification. Odor sometimes is a factor. The needles on a white spruce give off an aroma similar to that of a skunk, reports the “National Audubon Society Field Guide to Trees.” The texture of needles is also something to consider. Norway spruce needles are quite stiff, but those on a tamarack are soft.